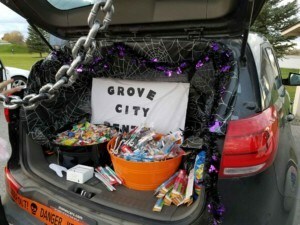 Another spooktacular Halloween has come and gone and the staff at Grove City Dental enjoyed every second of it. 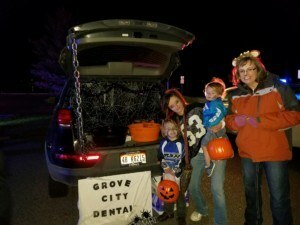 This year we joined the Bingham Police department for trunk or treating at the Grove in Blackfoot. Over 2000 little ghosts, goblins, and ghouls came through to enjoy the event, grab some candy, and have fun with great people in the community. 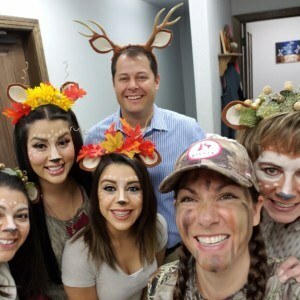 As we admired the amazing costumes of kids and parents alike, we were able to hand out not only candy, but 500 toothbrushes, flossers, and $100 off coupons. After all, our first priority is the dental health of our community. We had the pleasure of feeding 25 of Bingham Police department’s finest officers, rescue officers, and the community watch some delicious local pizza. We want to give a special thank you to the county sheriff’s department for making this event possible. We had a blast and look forward to being able to make it an annual tradition. Remember, a bag full of candy can be a tasty treat, but can also be your oral health’s spookiest nightmare. So, make sure you brush, floss, and contact our office for routine visits. We want to help you keep your smile healthy and dazzling. See you next year!